To request a quote, call us at (855)-578-7473 or fill out the information below to contact us. 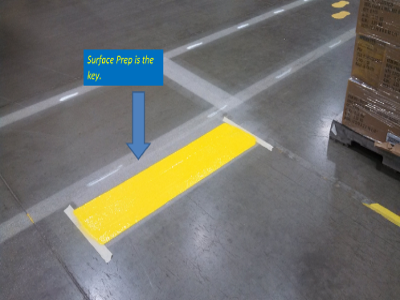 Warehouse floor marking and striping is a great way to increase safety and efficiency for your facility. Similar to parking lot striping, floor markings are one of the best ways to create a visual workplace. With the variety of colors and shapes of floor markings available, this can be easily accomplished. When done correctly, these long-lasting warehouse floor markings can hold up to even the highest trafficked areas, helping you promote safety, organize your inventory, and save you money and downtime that’s associated with routine maintenance. Since 2003, ProMark Contracting has helped companies and facilities with their warehouse floor marking needs. From line removal to permanent warehouse floor marking installation, ProMark Contracting can get the job done, and do it accurately. Applying the correct materials to your concrete surface requires experience and the proper surface preparation. One of the biggest advantages to working with us is our in-depth understanding of the floor surfaces found in warehouses and plants, which gives us the unique capability to not only install warehouse floor markings, but to prep your floors beforehand as well. We offer the best materials for warehouse striping that will be compatible with your surface to provide a long life and durability. Installing markings that are resistant to heavy tow motor traffic, chemicals, and that outperform conventional methods is our area of expertise. Let’s face it, conventional methods do not work. These methods of warehouse floor striping will not allow markings to adhere to concrete that is not properly cleaned and profiled. Conventional methods look good for about a month before they begin to break from the surface, collect dirt, and quickly fade. If you’re tired of constantly having to repaint old, faded line striping that will not hold up to tow motor traffic, then we are the warehouse floor marking company for you. 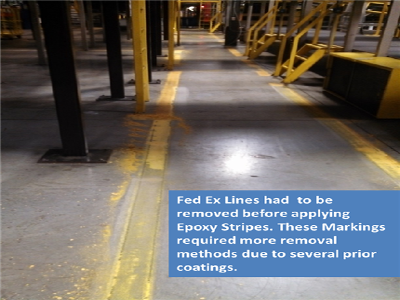 Unlike other warehouse floor marking companies, we utilize epoxy coatings to create more durable and long-lasting lines. This reduces the need for repeat maintenance to touch-up or repaint the markings. Our system can last 5 to 20 times longer than conventional methods, depending on the conditions, and can help save you money and downtime in the long run. Depending on what type of floor you have, we will determine the best marking material and floor prep for your warehouse striping project to better provide you with long-lasting quality. Not looking for permanent warehouse floor markings? We can also make the markings temporary in case you are concerned about having to remove them when your lease is up. We offer line removal services as well for when the time comes. No matter what your requirements may entail, we have the warehouse striping services to accommodate your needs. Many facilities are adopting lean manufacturing or 5S floor marking systems to increase efficiency and organization within their warehouses. These programs are all about eliminating waste in order to better streamline the facility. Lean 5S floor marking systems utilize highly visible floor markings to enforce strict organization to facilitate increases in efficiency through the use of color, text, shapes and symbols. 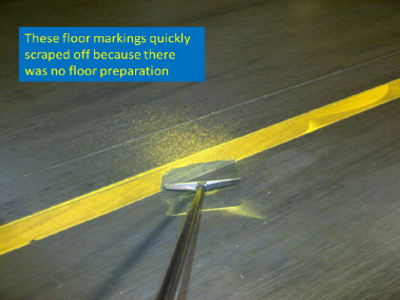 Need 5S floor marking to become standard in your facility? Our 5S floor marking system can help save your bottom line by removing the need to continuously shut down operations for constant repainting. Unlike other warehouse striping companies, we install floor markings that last so you will not have to repaint them, helping you to maintain a professional image. Our lean 5S floor marking system will help you sort your inventory and standardize your pedestrian, tow motor, and general work-flow traffic, and can even help you meet OSHA floor marking requirements. The Occupational Safety and Health Administration (OSHA) requires a specific set of standards that all facilities must follow to ensure a safe working environment for employees. These standards include OSHA floor marking requirements, which reference recommended widths for aisles and passageways, load capacity signage, and more. Our team of experienced warehouse striping specialists are well-versed in the latest OSHA floor marking requirements and can help your facility meet these important safety standards. Whether you are getting warehouse floor markings for the first time or need to reconfigure your current 5S floor markings to improve efficiency, ProMark Contracting can help. We provide long-lasting, durable floor markings that will hold up under high-trafficked areas. We’ve worked with a variety of companies and facilities including FedEx, Costco, UPS, Walmart and more. Learn how we can help fulfill your facility’s warehouse striping needs by contacting us today!